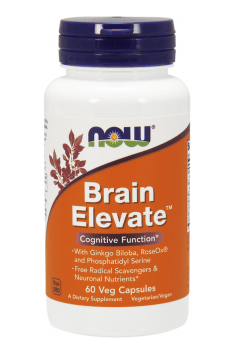 Now Foods Brain Elevate is an advanced formula providing key elements, which ensure maximal support for the nervous system and strengthen mental ability. The supplement contains only natural and organic components, among which dominate valuable substances nourishing brain and plant extracts known for their nootropic properties. The preparation is recommended to people aiming at memory improvement, the increase of cognitive abilities and better clarity of mind. It constitutes a perfect and safe alternative to synthetic preparations of this kind. It doesn’t contain caffeine and stimulants, therefore it may be used without the risk of side-effects in the form of nervousness and excessive agitation. The ingredients of the preparation, apart from nootropic properties, demonstrate high neuroprotective and antioxidant activity. Thanks to this, the supplement may be used in cognitive disorders connected to aging of the organism or being the result of neurodegenerative diseases. It also constitutes a valuable element of prophylaxis of the ailments in the area of the nervous system. Plant components – include high-quality extracts from four exceptional plants, used for ages with the aim of supporting memory and cognitive functions. They provide numerous natural nutritional compounds and unique, pharmacologically active substances, which don’t occur elsewhere. The synergy of activity and complex mechanisms of the influence on the human organism are the guarantee of the highest effectiveness. Ginkgo biloba – loosens blood vessels, inhibits platelets aggregation and facilitates circulation. Additionally, it protects neurons against oxidative stress and damages caused by the excess of free radicals. The stimulation of circulation improves blood supply of brain vessels and allows to provide proper amount of oxygen, glucose and valuable nutrients to the brain. The brain supplied in such components works more efficiently, the communication between neurons improves and all brain processes go faster. Ginkgo biloba extracts contribute to maintaining the balance between the key neurotransmitters – noradrenaline and dopamine and even have the tendency to slightly increase dopamine level. Higher level of dopamine results in the ease to focus attention, lack of problems with planning, analyzing and making decisions or drawing logical conclusions. Rosemary (Rosmarinus officinalis) – contains a range of substances with high biological activity, among which the most important is carnosic acid. This compound conduces the synthesis of nerve growth factor (NGF). NGF is a neurotrophin responsible for the growth and condition of the nervous tissue. It plays a protective and regenerative function for axons and neurons. The higher the NGF concentration, the more effective the communication between neurons and consequently –higher mental efficiency. Rosemary extracts limit the activity of acetylcholinesterase, thanks to which they contribute to the increase of the level of acetylcholine, so important for good memory. They also inhibit the activity of pseudo-cholinesterase – an enzyme playing the key role for the development of Alzheimer’s disease. Gotu kola – (Asiatic pennywort) is a well-known adaptogen and a universal memory booster. Gotu kola gentles hyperactive nervous system, helps to stop “racing thoughts”, thanks to which it facilitates concentration and accelerates the process of knowledge acquisition. The key role of Gotu kola in the improvement of cognitive functions is the increase of BDNF level (brain-derived neurotrophic factor) – a protein promoting the growth, development and longevity of brain cells. The higher the level of BDFN, the stronger the condition of neurons and consequently better memory and higher mental efficiency. Huperzine A – is an alkaloid extracted from the Chinese plant Huperzia serrata. By influencing the cholinergic system, it contributes to the improvement of memory and facilitates the processes of knowledge acquisition. Huperzine A increases the level of the neurotransmitter, which is the most important for good memory, i.e. acetylcholine. Higher the level of acetylcholine facilitates learning, memorizing new information, improves the ability of concentration and accelerates the pace of processing and analyzing facts. Huperzine A also has neuroprotective properties. It regulates the level of iron in the brain, which in excessive amounts may lead to the death of neurons and consequently to the development of neurodegenerative diseases. Nutrients – provide the brain with the key compounds, essential to the proper growth, development and functioning of neurons. Even if they are naturally synthesized in the organism, the amounts are usually too low in order to ensure optimal mental efficiency. Providing them in the form of supplements is reflected in the improvement of intellectual ability and better memory. Phosphatidylserine is a phospholipid, important component of cell membranes. It maintains proper liquidity of cell membrane walls, their proper permeability and the ability to communicate, which is reflected in the improvement of cognitive functions. It increases the level of acetylcholine, thanks to which it strengthens memory. It nourishes brain, increasing its neuroplasticity. L-glutamine is one of the most important nourishing substances. It easily crosses blood-brain barrier, where it is transformed in glutamic acid. Glutamic acid is one of the most important neurotransmitters taking part in the process of the creation of memory traces. It also facilitates coding and tracing information. Choline – is the component of cell membranes, maintains myelin sheaths in the proper condition and is essential for acetylcholine production. It ensures nervous cells health and optimizes nerve transmission. Summing up, Brain Elevate is an effective preparation combining natural substances significant for the optimal functioning of the brain. It will work perfectly among people prone to large intellectual effort and intellectual workers, who are required concentration, creativity and incredible mental efficiency. It may be a valuable support for students and pupils in the period of preparations for exams. Seniors will also benefit from the supplementation, among whom the problems with memory and the decrease of cognitive functions are natural consequences of passing time. 1 capsule 1 to 2 times a day. Do not exceed the recommended daily dose. Brain booster based on natural ingredients. It doesn’t contain caffeine and synthetic stimulants. It doesn’t cause excessive agitation, nervousness and anxiety. Use according to the producer’s recommendations. Max. 2 capsules a day at the intervals of a few hours. For better absorption it may be joined with a meal. The preparation improves circulation and has a slightly energizing effect. Because of this, it is recommended to use in the first half of the day. Cellulose (capsule), Rice Flour, Magnesium Stearate (vegetable source) and Silica. Contains soy (phosphatidyl serine from soy lecithin) (non-GMO). Rosemary (Rosmarinus officialis) is a plant grown in Europe. Its active biological material is a rosemary leaf (Folium rosmarini). Used for a long time in traditional medicine, it is also appreciated kitchen spice. The raw material contains i.e..: amarin, phytosterols and flavonoids, tannins, organic acids (including polyphenol acid [lot and rosemary] chlorogenic oleanolic valeric acid), essential oil, picrosalvin, tripertens.